Some of you may have noticed a new “inbox” that has been quietly added to the scene of email management. Last year Microsoft introduced a new addition to Outlook referred to as “Clutter.” Clutter is designed to help users focus on the important stuff and serves as a smart filter for your inbox. Let’s take a look at what Clutter is, how Outlook determines what is inbox “clutter,” and how to manage it. So just what is my Clutter inbox? Your clutter inbox is basically a filter that analyzes the way you read your email and hides the things that it determines you’re unlikely to read or respond to. Think of it as a “sub-inbox” for your low priority emails. Well, what’s the difference between this and my junk email? Clutter, however, comes from valid sources, or people you have interacted with. These emails are usually marked as clutter because you’ve chosen to ignore a significant amount of their recent messages. These could include groups you belong to or newsletters that you’ve signed up for, but just never found the time to read. 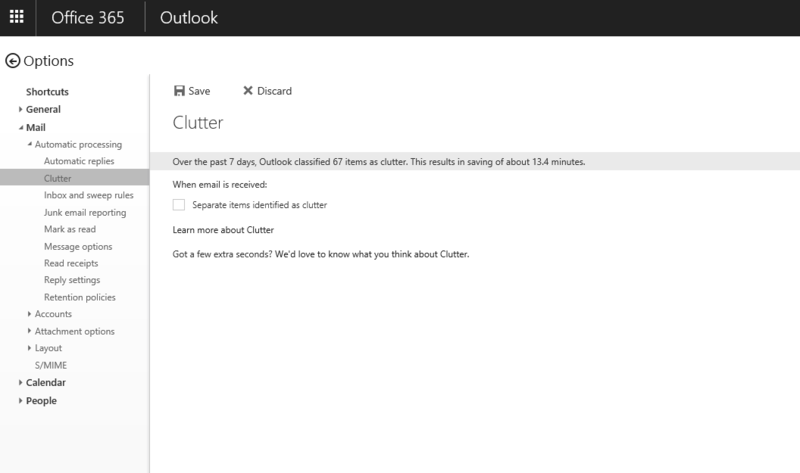 How does Outlook determine what is clutter? Clutter basically second guesses its users by analyzing previous email behavior patterns, as well as content, to determine whether you will actually interact with an email. It looks at various aspects of your messages such as its importance, the sender, whether you have participated in the conversation, or if you’re the only recipient. The more you interact with your clutter box, the more it begins to learn your patterns (we’ll talk about teaching it later) and then adapts as your reading habits change. Once turned on, the email server keeps track of everything you interact with and everything you don’t and filters your messages accordingly. But don’t worry, Clutter will never separate messages from you, your direct reports or anyone in your management chain. Where do I find my Clutter? Your Clutter inbox is sitting there right in your menu, usually somewhere around your deleted items and your Conversation History. How do I Manage My Clutter Inbox? You have two choices when it comes to your Clutter box: teach it what you want it to know or turn it off. Let’s start with the second. If you decide that Clutter is just not for you, shutting it off is easy peasy. Right-click the Clutter folder and choose Manage Clutter, this will open your Outlook on the web. If you’ve decided to give Clutter a shot, first things first – make sure it’s turned on. Follow the same steps as above but select “Separate items identified as clutter.” You may also want to choose to receive notifications as well. Once you’ve turned the option on, you just need to let it do its thing and watch to see how accurate it is. If Clutter gets it wrong, either drag and drop or right click that email back into your inbox or out of your inbox. By doing this, you’ll teach Clutter a lesson and over time Clutter will become more and more intuitive about how it handles your emails. By using the Clutter feature, you’ll get back all that time you usually spend filtering through all the, well, clutter in your inbox. 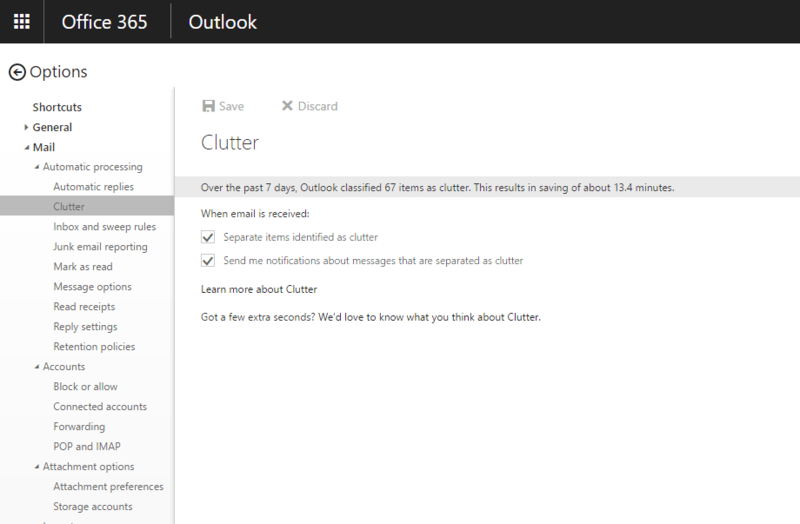 And Clutter is just one of the ways that Office 365 is helping you revolutionize the way you spend your time. Want to learn more about how Office 365 can improve your day to day productivity? Simply contact FMT using the form below. We’d be happy to help you!